Understanding tornados is not just for the storm-chasers that bring us incredible footage from the front lines of deadly twisters. We are all affected by tornados at some time or another, and knowing more about the science of tornados can help all of us - even if it is only to empathize with those tragically affected by the destruction these unpredictable storms leave behind. In simple terms, tornados are formed during severe weather cycles that combine thunderstorms, colliding air masses (or fronts), a combination of cold and warm air, and high and low pressure changes. When two or more moving air masses (cold or warm fronts) collide, strong weather will develop. Rain and hail are commonplace in a thunderstorm, but when the pressure and temperature changes are significant, high winds are concentrated and accelerated, and often result in a tornado. As the colliding fronts intensify, specific regions of thunderstorms will develop a mesocyclone high up in the atmosphere. This massive rotation can be anywhere from a couple miles wide, to as much as 10 miles in diameter. This giant system is the tornado. One interesting theory with mesocyclones is that the rapid changes in wind speed, and wind shear from rising warm air drawn up in to the mesocyclone system, cause horizontal tube-like vortexes to form within a severe thunderstorm. As the warm updraft continues, the tube-like vortex gradually turns vertical. As it becomes upright, the separation between the rising warm air and surrounding cold air concentrates, resulting in faster, more destructive wind speeds. This is also why we will often see intense hail storms surrounding a tornado. The cold air drops quickly, and the moisture condenses in to an ice storm - which becomes a tell-tale sign that a tornado is imminent. Experimentation with miniature tornado models can help us to understand further what is happening when these unpredictable storms strike.Making a miniature tornado combines simple supplies from your hardware store and uses them to simulate and create a beautiful vortex that you can modify and manipulate as long as you keep your dry ice stocked! 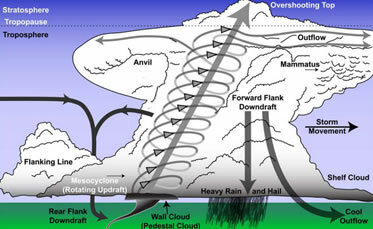 A basic vent-fan acts as the mesocyclone, creating the rotation needed to make the miniature tornado. Then a pie tin or small pan at the base of the chamber holds hot water (replenished often), which represents warm surface temperatures. When dry ice is placed in the tin, or the hot water replenished over the dry ice, we can clearly see the varying effects of the rising warm air combined with the rotation of the vortex. By manipulating the speed of the fan, the amount of dry ice, the temperature of the water, and the amount of air allowed in to the chamber, we can observe changes in the intensity, structure, and stability of our simulated tornado. Perhaps with these small changes and observations we can help our children understand more the elements that affect tornados, and the deadly weather we have seen recently.